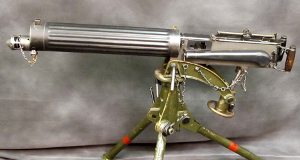 Museum quality early non-firing Vickers machine gun is for sale at IMA. Deactivated and legal in US, this gun was repurchased from a customer and there is only one for sale like this. Only $2995.00. According to IMA these early fluted water jacket guns are almost unattainable today, so don't delay!